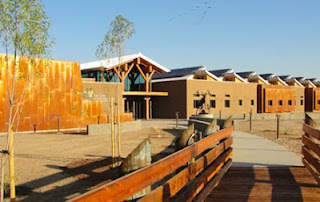 Catalyst's Net Zero Energy / LEED-Platinum (Seeking) San Luis National Wildlife Refuge project earned the highest award as the Overall Competition winner, and winner of the Commercial/ Industrial/ Institutional category at the Structural Insulated Panel Association’s (SIPA) 10th Annual 2012 Building Excellence Awards ceremony, held at the SIPA Annual Meeting in Texas. Building Excellence Awards highlight innovative projects using SIPs for energy-efficient, green buildings. Entries were evaluated on energy efficiency, design and structural engineering innovation, environmental sustainability, and creative use of SIP construction.